For other uses, see Light infantry (disambiguation). Light infantry sometimes carried lighter muskets than ordinary infantrymen while others carried rifles and wore rifle green uniforms. These became designated as rifle regiments in Britain and Jäger (hunter) regiments in German speaking Europe. In France, during the Napoleonic Wars, light infantry were called voltigeurs and chasseurs and the sharpshooters tirailleurs. The Austrian army had Grenzer regiments from the middle of the 18th century, who originally served as irregular militia skirmishers recruited from mountainous frontier areas. They were gradually absorbed into the line infantry becoming a hybrid type that proved successful against the French, to the extent that Napoleon recruited several units of Austrian army Grenzer to his own army after victory over Austria in 1809 compelled the Austrians to cede territories from which they were traditionally recruited. In Portugal, 1797, companies of Caçadores (Hunters) were created in the Portuguese Army, and in 1808 led to the formation of independent "Caçador" battalions that became known for their ability to perform precision shooting at long distances. United Kingdom - The Rifles is the largest infantry regiment in the British Army. It is the result of years of amalgamations and is descended from many British light infantry and rifle regiments, such as the Oxfordshire and Buckinghamshire Light Infantry (later part of the Royal Green Jackets) and the King's Shropshire Light Infantry (later part of The Light Infantry). It carries many light infantry and rifle traditions and "golden threads" of its parent regiments. Infantry intended for difficult terrain such as mountains or arctic conditions (Royal Marines, United States Army 10th Mountain Division, United States Army 86th Infantry Brigade Combat Team (Mountain), Italian Army Alpini, French Army 27ème bataillon de chasseurs alpins) or jungle (Philippine Army Scout Rangers, Brazilian Army Jungle Infantry Brigades). Brazil – There are two light infantry brigades, (11º Brigada de Infantaria Leve and 12º Brigada de Infantaria Leve Aeromóvel), and an airborne infantry brigade (Brigada de Infantaria Paraquedista). The 12º Light Infantry Brigade and the Airborne Infantry Brigade both belong to the Força de Ação Rápida Estratégica (Quick Strategic Action Force), which is composed of units capable of rapidly engaging in combat anywhere in Brazil. Ireland – All Irish infantry troops are trained and equipped as light infantry soldiers. Canada – Each of the three regular army regiments (Princess Patricia's Canadian Light Infantry, Royal Canadian Regiment and Royal 22e Régiment) maintains their third battalion as light infantry capable in airborne, mountain, and amphibious operations. All reserve infantry units are classed as light infantry, all with varying degrees of capability. France – light infantry units use the name of "hunters" (chasseurs), such as the chasseurs à pied or Light Infantry, chasseurs alpins or Mountain Light Infantry or chasseurs parachutistes or Airborne Light Infantry. India – Jammu and Kashmir Light Infantry, Sikh Light Infantry, and the Maratha Light Infantry regiments form part of the infantry Orbat. United States Army 75th Ranger Regiment is a flexible, highly trained, and rapidly deployable airborne light infantry unit, used for special operations. The British SFSG and the Canadian Special Operations Regiment carry out similar tasks. The 82nd Airborne Division,173rd Airborne Brigade Combat Team, and the 101st Airborne Division are also light infantry units which can be quickly deployed when needed. Seaborne or ship-based units, such as the United States Marine Corps' MEU (SOC) and The United Kingdom's 3 Commando Brigade which includes the Royal Marines. Troops involved in guerrilla or counter-guerrilla warfare. In the Australian Defence Force riflemen are employed by the Australian Army in both the Regular Army and the Army Reserves. Riflemen in the Australian Army are members of the Royal Australian Infantry Corps. Riflemen in the Regular Army are organised into seven battalions of the Royal Australian Regiment. Riflemen of the Army Reserve are organized into individual state and university regiments with reserve depots being found in many places throughout rural and metropolitan Australia. The light infantry was organised in France in the 18th century. A Chasseur designation was given to certain regiments of French light infantry (Chasseurs à pied) or light cavalry (Chasseurs à cheval). The name Chasseurs à pied (light infantry) was originally used for infantry units in the French Army recruited from hunters or woodsmen. Recognized for their marksmanship and skirmishing skills, the chasseurs were comparable to the German Jäger or the British light infantry. The Chasseurs à Pied, as the marksmen of the French army, were regarded as elite light companies and regiments. The first unit raised was Jean Chrétien Fischer's Free Hunter Company in 1743. These units were often a mix of cavalry and infantry. In 1776 all the Chasseurs units were re-organized in six battalions, each one linked to a cavalry regiment (Chasseurs à cheval). In 1788, the special link between infantry battalions and cavalry regiment was broken. 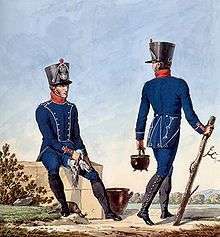 In 1793, the Ancien Régime Chasseurs battalions were merged with volunteers battalions in new units called Light Infantry Half-Brigades (demi-brigades d’infanterie légère). In 1803, the half-brigades were rebranded regiment. These units had three battalions of three regular Chasseurs companies, one elite Carabiniers company and one reconnaissance voltigeurs company. Chasseurs à pied regiments : three regiments (1809-1815 ; 1815-1815 ; 1815-1815). The regiments were the elite of the light infantry regiments. Voltigeurs regiments : 16 regiments, originally two regiments of Tirailleurs-chasseur and two regiments of Conscrits-chasseurs (1810-1815), then twelve new regiments (1811-1815). These regiments were expected to become Chasseurs à pieds regiments. The Napoléon-type Light Infantry regiment existed till 1854, but with very few differences from the line infantry regiment, so the 25 remaining light infantry regiments were transformed in line infantry in 1854. The Duke of Orléans, heir to the throne, created in 1838 a new light infantry unit, the Tirailleurs battalion. It soon became, under the name Chasseur à Pied, the main light infantry unit in the French Army. The number of battalions grew up steadily through the century. The current Chasseurs battalions drew their lineage form this unit. Some of Chasseurs à pied battalions were converted to specialized mountain units as Bataillons de Chasseurs Alpins in 1888, as an answer to the Italian Alpine (Alpini) regiments stationed along the Alpine frontier. The Chasseurs forestiers (Forest Huntsmen) were militarized units of the Forest Service. They were organized in companies. The Chasseurs forestiers existed between 1875 and 1924. The Zouaves battalions and regiments were colonial troops, formed originally by Algerians, then by European settlers and colonists. The first Zouave battalion was created in 1831 and changed its recruiting to Europeans in 1841. Tirailleurs (Skirmishers) were light infantry who formed a shallow line ahead of the line of battle during the Revolutionary/Napoleonic Wars and subsequently. The name was also used for the locally recruited colonial troops in the French Empire between 1841 and 1962. The Chasseurs à pieds evolved during the mid-XXth century into mechanized infantry units (Chasseurs mécanisés) or armored division infantry (chasseurs portés). After World War Two, all Chasseur units were organized on the mechanized infantry model. The Chasseurs alpins', mountain warfare units of the French Army created in 1888. Officer of the 7th battalions of Chasseurs Alpins in winter dress. The Chasseurs pyrénéens were the short-lived (1939-1940) mountain warfare units formed in the Pyrénées. The Chasseurs-parachutistes were airborne infantry units formed in 1943 from Air Force infantry compagnies transferred to the Army. After the independence of the countries that made up the French Colonial Empire, the Zouaves and the Tirailleurs units, save for one, were disbanded. Of the 28 Infantry regiment of the modern Indian Army, the following 10 are designated as "Rifles". They are distinguished by their black rank badges, black buttons on their service and ceremonial uniforms and also a beret which is a darker shade of green than the other regiments. Apart from these, two paramilitary forces: the Assam Rifles and the Eastern Frontier Rifles, also follows the traditions of the rifle regiment. In the Israel Defense Forces every soldier goes through some basic training of infantry, called "Tironut". However, the level of training changes according to the role and unit to which the soldier belongs. The "Rifleman" rating (in Hebrew: רובאי) includes basic military skills, physical training, military discipline and using assault rifle. More infantry skills (such as operating diverse weapons) are added as the level of training increases. Non-combat soldiers are trained as Rifleman 02. Combat-support troops are trained as Rifleman 03. Combat Engineering soldiers and infantry soldiers are trained as Rifleman 05. Combat soldiers of Armor corps and Artillery corps are trained as Rifleman 03. Field Intelligence Corps soldiers are trained as Rifleman 04. Combat Engineering sappers are trained as Rifleman 07. Infantry soldier are trained as Rifleman 07. Combat class commanders are trained as Rifleman 08. Combat Senior Sergeants are trained as Rifleman 10. Combat officers are trained as Rifleman 12. The Carabinieri also have the Squadrone Eliportato "Cacciatori di Calabria", nicknamed the "Falchi d'Aspromonte" (Hawks of the Aspromonte); although still technically a police force, it is tasked to oppose the criminal organization known as "Camorra". This organization has high numbers, its affiliates are usually armed with military-grade weapons (especially assault rifles and submachine guns, acquired on the black market), and operate deep within the mountainous region of the Aspromonte. Working against armed opponents and in such a harsh terrain, the Squadron acts, and its members are trained as, a light infantry airmobile unit. Another squadron, the "Squadrone Eliportato Cacciatori di Sardegna" was created by the Carabinieri to reduce the spree of banditism (mainly kidnapping) that afflicts the innermost areas of Sardinia. The Italian Navy has the San Marco Marine Brigade. Comprising three regiments (third is the school regiment), the Second acts as force protection for ships and is also tasked Vessel Boarding, Search and Seizure procedures; the First regiment is the proper Amphibious Assault regiment. Given that it has almost only light vehicles (the heaviest being the amphibious Arisgator and AAV7 landing vehicles) and is tasked to operate in harsh terrain (shore lines, lagoons, deserts, mountains, jungles), it is one of the purest "light infantry" units in the Italian Armed Forces. In the first half of the 20th century the Caçadores battalions were recreated as border defense units. In the 1950s, the title "Caçadores" was also given to the light infantry battalions and independent companies responsible for garrisoning the Portuguese overseas territories. Colonial troops with this title were recruited from both Portuguese settlers and from the indigenous populations in each overseas territory. At the beginning of the 1960s, several special forces companies of the Portuguese Army were named "Special Huntsmen" (Caçadores Especiais). These units wore a brown beret in the colour of the uniforms of the caçadores of the Peninsular War. Later these units were abolished and the brown beret started to be used by most of the units of the Portuguese Army. In the 1950s a paratrooper unit was formed in the Portuguese Air Force, known as "Parachutist Hunters" (Caçadores Paraquedistas). Later, battalions of Caçadores Paraquedistas were also created in Angola, Mozambique and Portuguese Guinea. In 1975, the designation "Caçadores" was discontinued in the Portuguese Armed Forces. All former units of caçadores were redesigned as "Infantry". Currently, every infantry soldier of the Portuguese Army is known as atirador. The Rhodesia Regiment had an affiliation with the King's Royal Rifle Corps since World War I. The regiment's badge was the Maltese Cross, the colours were red, black and rifle green and rifle green berets were worn. A private soldier had the title of "Rifleman". The Imperial Russian Army, which was heavily influenced by the Prussian and Austrian military systems, included fifty Jäger or yegerskii [егерский] regiments in its organisation by 1812, including the Egersky Guards Regiment. These regiments were disbanded in 1917-18. Spanish Riflemen were designated as Cazadores. Until the 1950s the British Army included six regiments specifically designated as light infantry. In contrast to the Rifle regiments (see below) those units were distinguished from other infantry regiments only by secondary details of uniform and insignia. They did however have the rapid ceremonial marching step which originated with the need to keep ahead of the slower moving line infantry columns in 18th century campaigns. Between 1957 and 1968 the light infantry regiments underwent a series of mergers and disbandments, with the surviving units becoming a single large regiment: The Light Infantry. This in turn was amalgamated into The Rifles in 2007. From their inception the British Rifle Regiments were distinguished by a dark green dress with blackened buttons, black leather equipment and sombre facing colours that gave them what was really a modern aspect - designed for concealment rather than display. This has been retained until the present day for those British units that still carry on the traditions of the riflemen. Their most famous weapon was the 'Baker rifle', which in the hands of the elite 95th regiment and the light companies of the 60th regiment and the Kings German Legion gained fame in the Peninsular War against Napoleonic France. During the Siege of Delhi the 8th (Sirmoor) Local Battalion along with the 60th Rifles defended Hindu Rao's House during which a strong bond developed. After the rebellion the 60th Rifles pressed for the Sirmoor Battalion to become a rifle regiment. This honour was granted to them next year (1858) when the Battalion was renamed the Sirmoor Rifle Regiment. Later all British Army Gurka regiments were designated rifle regiments; a nomenclature maintained to this day with the Royal Gurkha Rifles. The rank of Rifleman instead of Private was officially introduced in 1923. In the United States Marine Corps, the Military Occupational Specialty (MOS) 0311 is for "Rifleman." It is the primary infantry MOS for the Marine Corps, equivalent to the U.S. Army MOS 11B for Infantryman. The training for Riflemen is conducted at the U.S. Marine Corps School of Infantry. ↑ Hew Strachan (1988). European armies and the conduct of war. Routledge. ISBN 0-415-07863-6. ↑ Ross, Steven T. (1996). From Flintlock to Rifle: Infantry Tactics, 1740–1866. Taylor & Francis. ISBN 978-0-7146-4193-5. ↑ "About the Royal Green Jackets". Retrieved 6 June 2011. ↑ Katcher, Philip; Walsh, Stephen (2002). Sharpshooters of the American Civil War 1861–65. Osprey Publishing. p. 4. ISBN 978-1-84176-463-4.